NSA: "yes, there is an ECHELON system"
After 27 years, the truth about the ECHELON surveillance system is out. 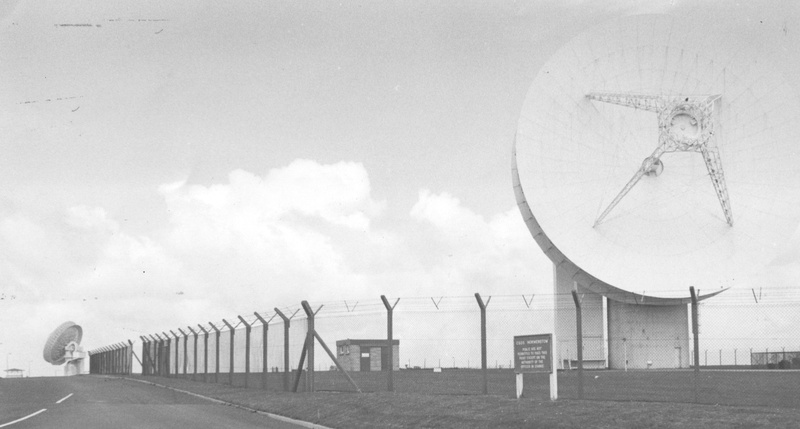 NSA documents, published in the Intercept, reveal that the ECHELON system was setup "at the height of the Cold War" to spy on the West's communication satellite network, Intelsat. "Yes, there is an ECHELON system", an NSA history note records, at the same time as making derisory references to the European Parliament's investigation in 2000 and 2001. The documents reveal for the first time that ECHELON was part of a larger program, covernamed, FROSTING and set up in 1966. One part of FROSTING, called TRANSIENT, targeted the Soviet Union's new Molniya [молния or "Lightning"] communications satellites. These were used for military and government communications. The second part, ECHELON, targeted the west's planned Intelsat satellites. These satellites were to be built and run by a consortium of western countries, the International Telecommunications Satellite Organisation (Intelsat). 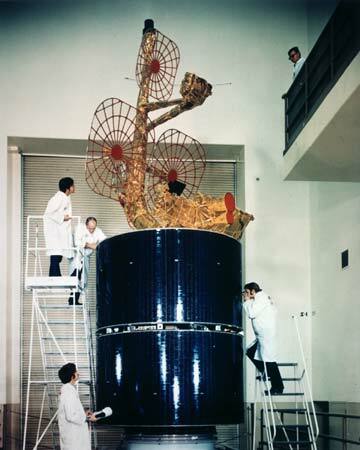 Intelsat satellites were and are used for TV broadcasts and for private, government and commercial communications. The parallel existence of the TRANSIENT and FROSTING satellite surveillance program has been unknown to historians and intelligence experts, until now. 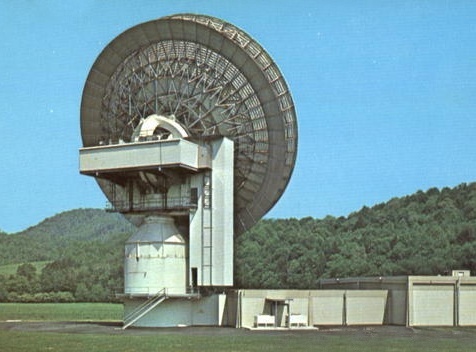 I revealed the ECHELON system in 1988 as the world's first global mass communications surveillance system. Except for New Zealand investigative journalist Nicky Hager (http://www.nickyhager.info/category/books], the revelations got no attention until the European Parliament investigation in 2000. According to an NSA document published by the Intercept, "FROSTING's two sub-programs were TRANSIENT, for all efforts against Soviet satellite targets, and ECHELON, for the collection and processing of INTELSAT communications". The full story, and the documents, are in the Intercept. The starting point of global mass surveillance is now documented and on the record. At the height of the Cold War, ECHELON's job was "to collect, process and forward selected International Common Access telegraphy [telegrams and telex], voice, and facsimile signals relayed over the [Intelsat satellites] to NSA for analysis and reporting]. All this took place before illegal NSA cable surveillance and intelligence operations were uncovered by the Watergate enquiries of 1973-1974. Even as the first Watergate enquiry began, ECHELON was expanding, the documents reveal. The second ECHELON site, at Yakima near Seattle started operations on 4 May 1973, and achieved "full operational capability" on October 1974. It intercepted communications carried on the Pacific Ocean region Intelsat satellite. The stations were managed from a "Terminal Operations Control" at NSA headquarters, using communications networks called STARBURST and OCEANFRONT. 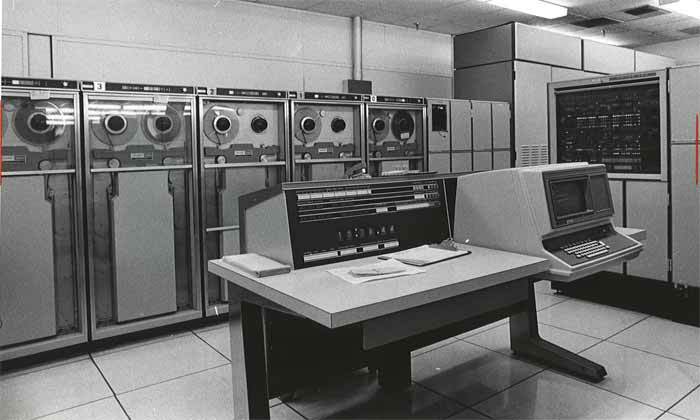 Before being forwarded to NSA, intercepted messages were first fed to a powerful (for its era) mainframe computer, a Univac 1108, for selection and sorting. 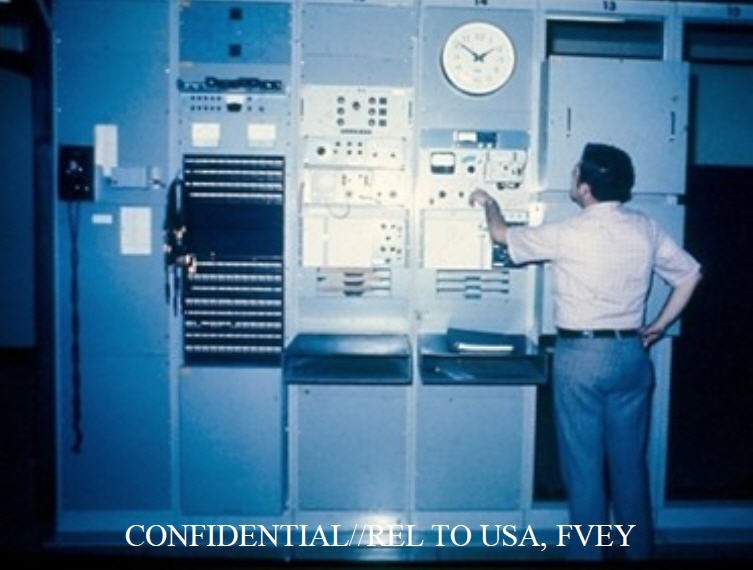 Univac claims that the 1108 was the first ever general purpose multiprocessor system. 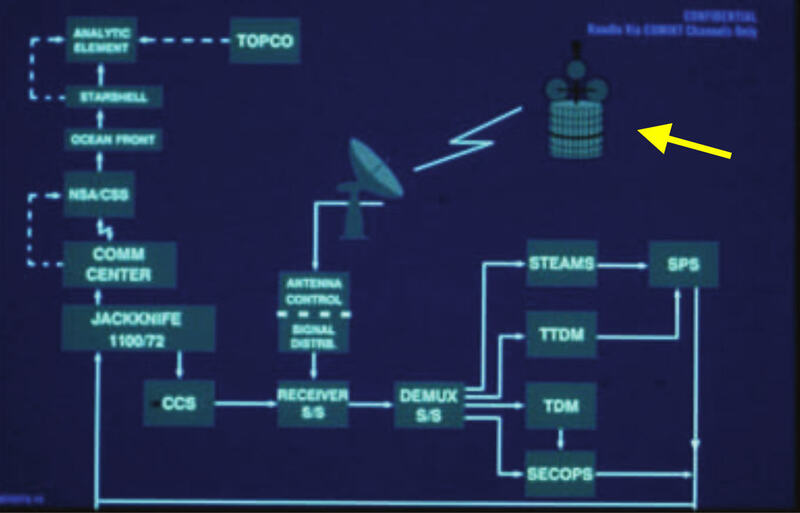 The illustrations below, from new NSA documents and public sources, show how as Western nations built up satellite communications systems from the 1970s on, NSA and GCHQ constructed secret shadow networks to listen in and copy private messages and telephone calls. The networks and systems from the 1960s which started as shown out here continue 50 years later, with volumes and surveillance capabilities multiplied to a level unimaginable then. Parallel operations for targeting western and Soviet Bloc satellites have now been merged into a global "FORNSAT" system, illustrated in many Snowden documents. Dictionary tools are "still used today by many Digital Network Intelligence (DNI) systems", in combination with software selection tools such as the XKEYSCORE system for global internet surveillance and analysis, to provide "high-speed content filtering, selection; and forwarding capabilities". "The CADENCE system fully automates the Front-End Dictionary Management process to filter and select intelligence. Dictionary managers and target analysts can electronically submit, review, and forward dictionary updates to scan traffic for keywords, to execute category rules and to define Boolean and positional equations of keywords." The Dictionary method of selecting surveillance information of interest, and the ECHELON "routing tokens" method to forward selected intercepts to requesters were still being used in 2010, according to one of the documents provided by Edward Snowden and published with my article. 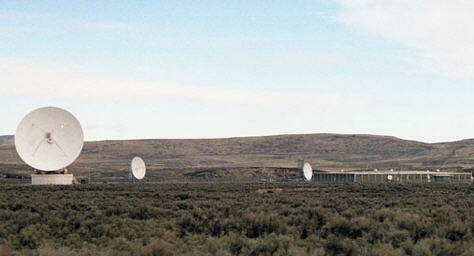 NSA's ECHELON system diagram for Yakima Research Station. The satellite target (marked by the added yellow arrow) can be seen to be Intelsat IV. After signal processing (bottom right), intercepted messages were automatically selected and fed through JACKKNIFE's Univac 1100/72 computer processor (left) and relayed to NSA.